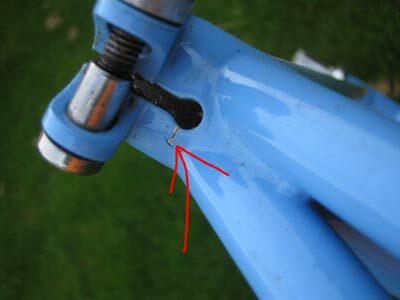 which is stupid really cos this is all about a bike frame rather than a mirror and I certainly ain’t a lady :o) So with that in mind I’ll come straight to the point… sadly my trusty Soma Rush frame cracked, a small fracture extending from the seat-tube slot. Nothing to do with me eating too my ice-creams this summer either, I’m still a svelte (!!) 64kg. Nope, just a weak point in the design I suspect and easily fixed with a brazing torch. I can’t be bothered* but if anyone reading this wants a crack at it then you can have the frameset as pictured (it’s in very good nick, size 55) for £25 inc shipping (in the UK). You might want to respray it after and I’m pretty sure I still have some spare Soma decals kicking around you can use. 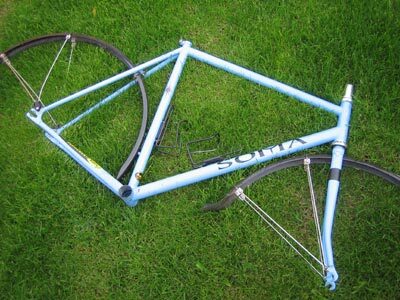 It will be a solid winter bike for someone… Let me know… it’s too good to consign to the dump. * can’t be bothered mainly ‘cos it’s a great excuse to have my perfect custom titanium fixed gear winter bike… ;o) Stay tuned for that. PreviousPrevious post: « worth getting out of bed for…. I sir, would love to take that off your hands for that princley sum. Email me jakeds AT gmail.com and I’ll have the money out to you if it’s still available. if he doesn’t have it mate, I’ll give it a loving home. cheers! Dont suppose you’d fancy swapping it for something ? i’ve got a shed full of stuff if you need anything.